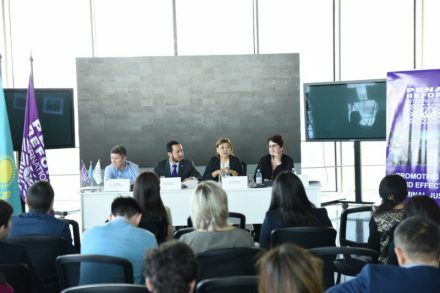 On 23 February 2017, Penal Reform International Central Asia, convened a press conference on ‘Prison reform in Kazakhstan: expectations and reality’. It coincided with the 10th anniversary of the UN Subcommittee for the Prevention of Torture, the UN detention monitoring body. PRI presented some trends in prison reform globally, and developments in Kazakhstan over the past year including on issues relating to the prevention of torture, conditions in detention and developments in rehabilitation/resocialisation and probation. PRI’s Central Asia Regional Director, Azamat Shambilov, noted “The Republic of Kazakhstan has achieved certain results in reforming its criminal executive system, with strategic documents relating to issues of resocialisation and probation adopted. However, there is a long list of problems which need to be worked on”. Kazakhstan has seen a decline in the size of its prison population over the past two decades, with a peak of 85,448 prisoners in 1995, now there are 36,343 (as of 10 January 2017). Today, Kazakhstan occupies 48th place globally (from some 190 countries) in terms of the total size of the prison population, and sits at 68th with the rate of imprisonment, with the country imprisoning 202 people per 100,000. PRI raised serious concerns on shortcomings with detecting and investigating cases of torture and ill-treatment in closed institutions. According to the Penal Committee of the Ministry of Internal Affairs of Kazakhstan, in 2015 only one officer faced criminal prosecution for an alleged offence, and in 2016, 12 employees were prosecuted for 4 offences. Other topics covered included: prison healthcare, the responsibility of the prison service (shifting from the Ministry of Internal Affairs to an independent agency, radicalisation in prisons, capital punishment, and the use of life imprisonment. Read the full press release in Russian and Kazakh.